Previous batches of ab19857 have worked well in IHC, but recent batches of this antibody are showing non-specific staining on day 6 mouse testis in our lab (as of Nov 2016). Synthetic peptide conjugated to KLH derived from within residues 300 to the C-terminus of Human Oct4. WB: Human and mouse ES cell lysates. ICC/IF: Mouse ES cells. Our Abpromise guarantee covers the use of ab19857 in the following tested applications. WB Use a concentration of 1 µg/ml. Detects a band of approximately 43 kDa (predicted molecular weight: 39 kDa). ab19857 staining Oct4 in F9 cells treated with trans-retinoic acid (ab120728) The cells were incubated at 37°C for 2 days in media containing different concentrations of ab120728 (trans-retinoic acid) in DMSO, fixed with 4% formaldehyde for 10 minutes at room temperature and blocked with PBS containing 10% goat serum, 0.3 M glycine, 1% BSA and 0.1% tween for 2h at room temperature. Staining of the treated cells with ab19857 (1 µg/ml) was performed overnight at 4°C in PBS containing 1% BSA and 0.1% tween. 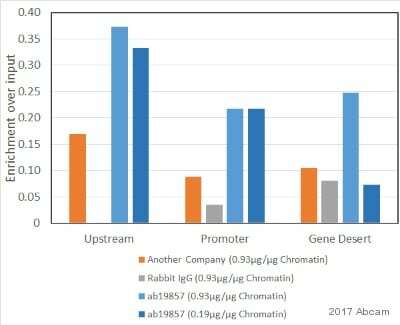 A DyLight 488 anti-rabbit polyclonal antibody (ab96899) at 1:250 dilution was used as the secondary antibody. Nuclei were counterstained with DAPI and are shown in blue. Lysates/proteins at 10 µl per lane. Additional bands at: 65 kDa. We are unsure as to the identity of these extra bands. MEL-1 and MEL-2 Human Embryonic Stem Cell Lysates (ab27198 and ab27196), IOUD2 Oct4-expressing Mouse Embryonic Stem Cell Lysate (ab27202) and F9 Mouse Embryonic Carcinoma Cell Lysate (ab27193) all contain Oct4 protein. As expected, a band corresponding to Oct4 was detected in all four of the lysates by Westen Blot using anti-Oct4 antibody ab19857. Each of the Oct4 bands was specifically blocked using the immunising peptide of ab19857. The origin of the additional 65 kDa band detected in Lane 3 is unknown and may be a non-specific band that is recognised, in addition to Oct4, by ab19857 in mouse embryonic stem cells. Overlay histogram of Oct4 staining in mouse embryonic stem cells using ab19857 at 1:100 dilution. 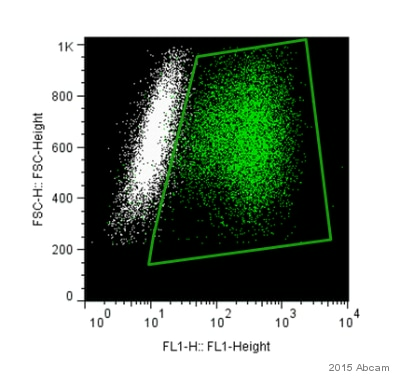 Purple histogram represents negative control (rabbit IgG); green line represents anti-Oct4 antibody (ab19857). Oct4 was immunoprecipitated using 0.5mg E14Tg2a whole cell extract, 5µg of Rabbit polyclonal to Oct4 and 50µl of protein G magnetic beads (+). No antibody was added to the control (-). The antibody was incubated under agitation with Protein G beads for 10min, E14Tg2a whole cell extract lysate diluted in RIPA buffer was added to each sample and incubated for a further 10min under agitation. Proteins were eluted by addition of 40µl SDS loading buffer and incubated for 10min at 70oC; 10µl of each sample was separated on a SDS PAGE gel, transferred to a nitrocellulose membrane, blocked with 5% BSA and probed with ab19857. 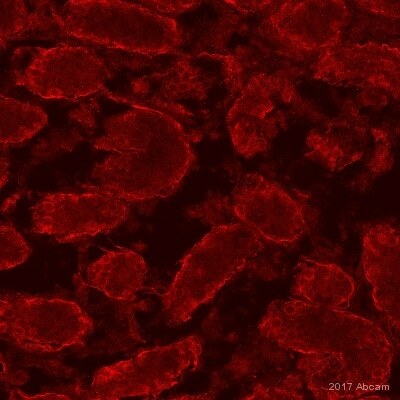 ICC/IF image of ab19857 stained Mouse Embryonic Stem cells. The cells were PFA fixed (4% PFA, 20 min) and incubated with the antibody (ab19857, 1µg/ml) for 1h at room temperature. The secondary antibody (green) was Alexa Fluor® 488 goat anti-rabbit IgG (H+L) used at a 1/1000 dilution for 1h. Image-iT™ FX Signal Enhancer was used as the primary blocking agent, 5% BSA (in TBS-T) was used for all other blocking steps. DAPI was used to stain the cell nuclei (blue). 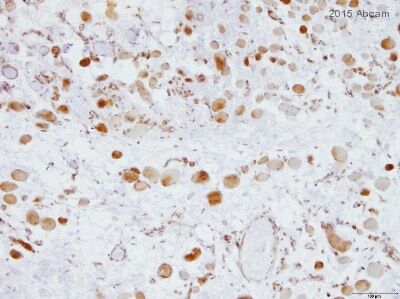 The large nuclei of the Feeder cells can be seen in the image; ab19857 does not localise to these nuclei. ab19857 can be seen localising to the much smaller nuclei of the Mouse Embryonic Stem cells. ICC/IF image of ab19857 stained mouse embryonic stem cells. 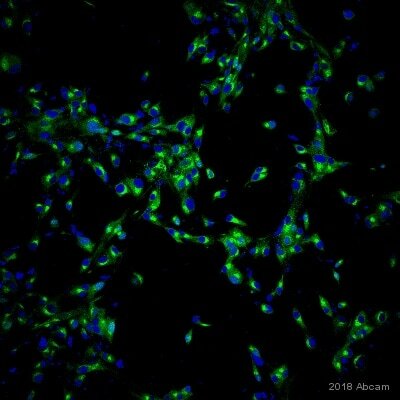 The cells were 4% formalin fixed (10 min) and then incubated in 1%BSA / 10% normal goat serum / 0.3M glycine in 0.1% PBS-Tween for 1h to permeabilise the cells and block non-specific protein-protein interactions. The cells were then incubated with the antibody (ab19857, 1µg/ml) overnight at +4°C. 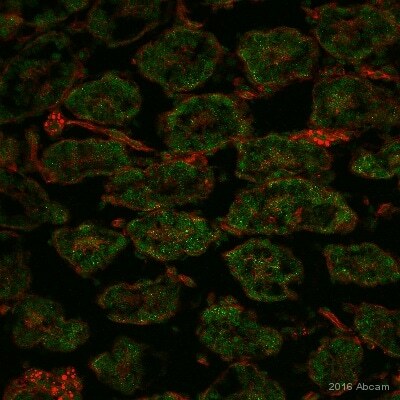 The secondary antibody (green) was Alexa Fluor® 488 goat anti-rabbit IgG (H+L) used at a 1:00 dilution for 1h. Alexa Fluor® 594 WGA was used to label plasma membranes (red) at a 1:200 dilution for 1h. DAPI was used to stain the cell nuclei (blue). Anti-Oct4 antibody ab19857 only detected a band corresponding to the expected size of Oct4 in human ES cell lysate. In mouse ES and EG cell lysates, ab19857 detected a band of approximately 55 kDa in addition to the expected 39 kDa Oct4 band. The image shows a colony of differentiating Human Embryonic Stem Cells double-stained with anti-Oct4 antibody ab19857 (green) and Sox17 antibody (red). The nuclei of Oct-4-positive undifferentiated hESCs stained bright green. Staining was restricted to the nuclei. Oct4-positive nuclei were Sox17-negative, and vice versa. This antibody can be used as a marker of Oct4-positive undifferentiated Human Embryonic Stem Cells. Publishing research using ab19857? Please let us know so that we can cite the reference in this datasheet.